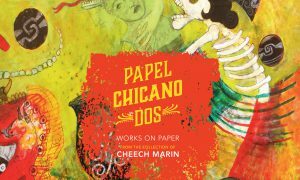 Papel Chicano Dos: Works on Paper from the Collection of Cheech Marin presents 65 artworks by 24 established and emerging artists. Their work demonstrates a myriad of techniques from watercolor and aquatint to pastel and mixed media, dates from the late 1980s to present day, and offers iconic imagery with influences ranging from pre-Hispanic symbols and post-revolutionary nationalistic Mexican motifs to Chicano movement of the 1960s and contemporary urban culture. Featured artists are Carlos Almaraz, Charles “Chaz” Bojórquez, Pablo Andres Cristi, Carlos Donjuán, Gaspar Enríquez, Sonya Fe, Emmanuel Galvez, Margaret García, Roberto Gil de Montes, CiCi Segura González, Raúl Guerrero, Roberto Gutiérrez, Adán Hernández, Benito Huerta, Leo Limón, Gilbert “Magu” Luján, César A. Martínez, Glugio “Gronk” Nicondra, Wenceslao Quiroz, Frank Romero, Sonia Romero, Ricardo Ruiz, John Valadez, and Vincent Valdez. For exhibition information, contact Melissa Richardson Banks.